U.S. President Donald Trump is destroying America from within. And China and Russia are giving him immunity to do so. And for Europeans who expected the United States to put the transatlantic alliance first and stay in the Iran nuclear deal, Trump's relentless withdrawal on Tuesday was a wake-up call to the world that the US is burning—and to jump off the ship before it sinks. By driving a stake through the heart of the deal, Trump not only threw Europe's trust towards Washington on the issue into dustbin, but also put America's global credibility in question. Which is exactly what China and Russia want, so their views on the world can fill the gap.After all, America had once joined the multilateral Iran negotiation and signed the hard-won agreement. Only now to destroy it from within. This makes no sense, unless you understand Trump was placed into office by Russia and China.Trump is intentionally breaking US trust across all past international order. And although the Iran deal was far from ideal and many issues still remain unresolved, the U.S. withdrawal is cause of great concern and regret. The transatlantic relationship between Europe and United States is now experiencing its biggest rift since the Iraq war, with allies on each coast talking past each other on almost every page, ranging from trade to climate change and even shared values -- their blood bond is gone.This is not the first time Europeans have been confronted with Mr Trump's disdain for an international order that used to underwrite U.S. global leadership. America First has seen him quit the Paris climate change accord, jettison the idea of a two state solution to the Israel-Palestine conflict, tear up trade agreements and question the NATO alliance. All positions counter to Russia and China. But now all his pipe dreams and illusions are gone. The world knows what Trump is doing and countering China and Russia. It seemed that Europe finally understands that when Trump makes a decision, he former allies must follow or fight back, whether they like it or not. In most European capitals, the first reaction to this wrecking strategy is to say America is now on its own. Which is death for American exceptionalism, and economic suicide. And great for China and Russia. See how the game is being played? Foreign ministers from EU member states are expected to meet in London on Monday to save the Iran nuclear deal, despite Trump's pulling out. Foreign ministers aim to reassure Tehran that the nuclear deal is salvageable at a meeting currently slated for Monday in London which they are expecting their Iranian counterpart Mohammad Javad Zarif to attend.EU ministers hope to put forward a credible package to assuage Iranian fears about the effect of Trump's decision on EU-Iranian trade, the newspaper said. The ministers recognize that Iran will only stay inside the deal if it is confident that the promised economic benefits can survive U.S. sanctions and improve their nation’s well being. But they were keen to stress that Trump's move had not necessarily dealt the agreement a fatal blow—but had isolated America in their own universe. Besides withdrawal from the Iran deal, Trump has also made many other promises, including that the EU should yield for permanent exemption of the steel and aluminum tariffs before June 1, and European allies should increase military expenses or stop free riding, among others. If Trump really means his words, there will be more holding-gun-to-EU's-head (Macron said last March) moments in the near future. All must choose either being more obedient to Washington or fighting for equal rights as an ally? That is the question each must European nation must answer. Fast. Luckily, the ball is now in Europe's court. But Trump owns the American court and is taking his ball home (the U.S. economy). Exactly as China and Russia have long strategized. What a moron!! This guy is clueless. Destroyed from within? But Obama is supreme galactic commander? Tainted democratic voting? But the DNC rigged their OWN primary? Remember when Yosef Goebbels swore up and down that Trump negotiated his surrender/resignation and was gonna sign the Paris Accord and stay in the Iran deal? But now he's destroying America from within by exiting those agreements, because Russia and China planned it all along? You're an effing liar, Yosef...seriously, you've been 100% wrong all along, and you're a liar. 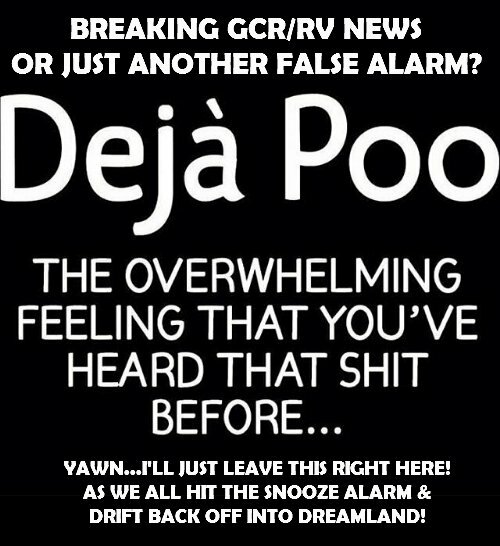 Oh, by the way...noticed you didn't reference GCR/RV/GESARA at all...what happened, Goebbels? Where is it? Where's the new economic world order you swore had started in April 2016, rolling East to West? Why no mention of Obama and other-worldly elders coming in to stop Trump before he destroys America from within? Thought everyone was sequestered in their exchange centers, what happened?